Stacked hipped and gabled rooflines create architectural interest. The entry leads straight ahead into the living room, where the glow from the fireplace adds to the light streaming through windows. The efficient, counter-lined kitchen opens to the window-lined dining area, and features a snack bar that serves both the living room and the nook. A formal dining room sits nearby. 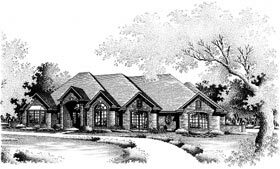 Both wings are devoted to more private areas, with the left wing housing the impressive master suite, a study, and a secondary bedroom, and the right wing, two more secondary bedrooms and the utility area. This home is designed with slab and crawlspace foundation options.